BikeArlington has teamed up with bike blogger Brian McEntee of Tales of the Sharrows to present the Ultimate Arlington Grocery Store Bike Parking Guide. 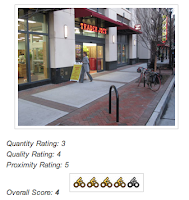 Brian visited 16 grocery stores in Arlington, took photos and rated the bike parking. It's a great way for utility cyclists to check out what the parking situation is before shopping at a specific store. It seems that Arlington has many of the same problems with substandard bike parking as Fairfax, despite having good bike parking standards. Several of the racks shown are either incorrectly installed or not the recommended type of rack indicated in the standards. We need a similar guide in Fairfax but given our size and the number of grocery stores in the county, it will be a challenge to put it together. It would also be nice to have a group like BikeArlington to support cyclists in Fairfax. Sixteen grocery stores in Arlington County were surveyed to assess their bike parking (both bike parking provided by the store and bike parking facilities placed by the County) in terms of quantity, quality (type of rack) and location (proximity to entrance). Each store is rated on a scale of 0 to 5 "gold bikes" with 0 gold bikes being worst and 5 gold bikes being perfect. Those three categories scores are added up and averaged for an overall score. Bicycle parking is such an afterthought for retail stores in our area. Even Target didn't install their post and ring types correctly. Not that it matters because they've decided to put a concrete trash can up against it. At Trader Joes they use the outdated schoolhouse rack to keep their shopping carts from rolling away. Retailers need to ask themselves, would I do that in a (car) parking space?